This week, "World News with Diane Sawyer" broadcasts from China to answer some questions about the country's staggering economic growth -- 10 percent in one year. What does it mean to America, and the future of American jobs? What are the secrets of the turbocharged Chinese ambition? The answers offer a picture of China, by the numbers. Across the country, China is spending $100 billion on infrastructure, twice the amount President Obama has requested in the United States. 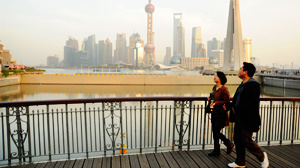 The Shanghai skyline, with its towering skyscrapers, was built in record time, just two decades. Large projects, like a sixteen-lane bridge, are completed in the time it takes just to acquire the building permits in the U.S. Just last week, 200 workers built a 15-story hotel in six days, using prefabricated pieces that snapped together like Lego building blocks. Chinese engineering is speeding ahead in other areas, outdoing American efforts. By the end of next year, a train from Beijing to Shanghai will take just four hours. It will cover a distance equivalent to that between New York and Atlanta, a trip that takes Americans 18 hours. These latest displays of engineering ingenuity have prompted responses from U.S. officials, including President Obama. "It makes no sense for China to have better rail systems than us," Obama said at a press conference after the midterm elections. "And we just learned that China now has the fastest supercomputer on Earth. That used to be us." The Chinese are "making investments," the president said, "because they know those investments will pay off over the long term." Other leaders say the advancements are China's way of showing strength. In an interview with Diane Sawyer, California Gov. Arnold Schwarzenegger said, "We built the biggest solar plant in 1980. Then the Chinese came and outdid us because they're always there to flex their muscles. 'We're the biggest, we're the best.'" Tom Friedman, the author of "Hot, Flat, and Crowded," told Diane Sawyer the American political system is stalling growth in this country. "I think one of the problems, I think one of the saddest things going on in America is that politics has become so paralyzed, so gridlocked that we no longer believe we can get things done, so we no longer aspire to do big things," he said. America takes pride in being number one -- but China is home to the largest population on earth -- 1.3 billion people and counting -- who are ready to work as hard as it takes to get ahead. Every day, for every baby born in the United States, almost four babies are born in China. The government has launched a campaign to break the language barrier, and students are beginning to learn English as early as in kindergarten. Today more people study English in China than there are people in America. More Chinese are pursuing degrees -- the nation will produce more university graduates this year than India and the U.S. combined. The work ethic doesn't stop when they leave the classroom. All across the country, people sacrifice days off and time with their families. Li Feng, a partner at a venture capital firm who studied at the Massachusetts Institute of Technology, said working in Silicon Valley was like a vacation compared to keeping up at home in China, where there are no breaks, not even for meals. "I want to go back home for dinner, I would like to go back home for dinner but I seldom go back home for dinner because dinner is business too," he said. "I never have a weekend. I never had a weekend." The long hours are worth it in pursuit of a larger goal, he said. "The only thing we want to do is we want to change our lives. We want to get a better life quality by working hard." For the 300 million people who have lifted themselves out of poverty in less than a generation, the hard work has paid off. But for others -- 700 million others who survive on less than $2 a day -- extreme poverty is an ongoing reality. For all the change in China, 40 percent of villages don't have paved roads. And there are other enormous problems to tackle. One quarter of the country's water is unsafe to drink. Diane Sawyer caught up with some women in the countryside determined to make a little money, setting up makeshift restaurants and trying to recruit passerby to stop and eat. They said they don't make much money from their enterprise, but their farm produces enough vegetables to feed their families. Next door, a woman growing red beans in her front yard said life has improved a little for farmers like her, but she still has dreams. Sawyer asked, "What's the one thing you'd like to have now?" Despite the hardships she faces, she offered a bag full of melons as a parting gift. Other neighbors down the road proudly showed off a refrigerator, stocked with noodles, yogurt, and Pepsi. A man saved to send his son to college by growing wheat and corn, hoping for the next generation to break out of the poverty cycle. Despite China's rapid economic growth, the United States GDP currently dwarfs China's. For Friedman, the country that will dominate the next century must be willing to be a leader in certain fields. "The 21st century is going to go to the country or government that provides these four things: the best education for its people, the best infrastructure for its businesses, the best rule of law, and the best environment," he said. China's main goal, Friedman said, "is to restore its greatness, what it sees as its place in history as a great economic power, a great cultural power, a great political and geopolitical power." In order for the United States to continue to be the world's number-one economy in the face of such competition, Feng said Americans face a choice. "This is the choice of the American people," he said, "because everybody has to work hard to change their lives. American people can also work hard and keep the number one position." Click here for more from "World News" in China.